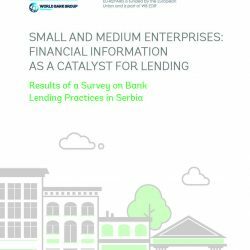 This paper presents the findings of a survey of bank lending practices to SMEs in Serbia conducted by the World Bank Centre for Financial Reporting Reform (CFRR)3 at the end of June 2016. It is based on the results of survey questionnaires and interviews with one local and five foreign-owned banks, which together account for approximately half of the Serbian banking market. This study evaluates current banking practices, as well as challenges and expectations relating to financial reporting and auditing in lending decisions. It also assesses how banks measure the quality of the financial information they receive as part of a loan application.